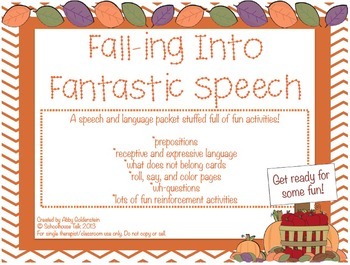 This activity packet includes a variety of fantastic autumn-themed speech and language activities as well as open-ended reinforcement games to help make practice mega-fun for any student PreK through Elementary age. Pg. 3-12: Where’s the Pumpkin? – Use this simple book with repetitive lines to understand and express preposition words. Includes targets for: beside, above, in front, behind, on, over, under. Pg. 13-19: Odd One Out – Identify the picture that is different from the rest of the group, then describe why that picture is different. Contains four pages with groups of three pictures and four pages with groups of four pictures (24 cards total). Pg. 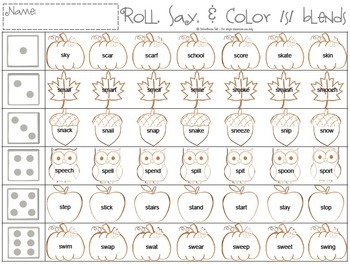 20-27: Roll, Say, and Color Pages – Roll the dice, then say a word in the corresponding row that number of times before coloring the picture. Includes pages targeting the following phonemes in 1-2 syllable words: /sh, ch/; /k, g/; /f, v/; /l/; /s/ blends; /th/. A blank page to create your own targets is also included. Pg. 28-30: Pumpkin Glyph – Answer the questions then decorate your Jack-O-Lantern according to the answer key. Includes blank space to draw and color your Jack-O-Lantern. 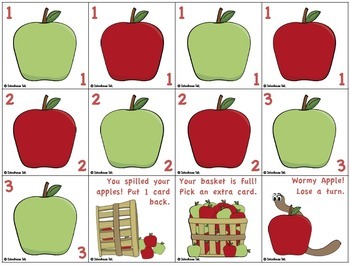 Makes a great bulletin board display or hallway décor. Pg. 31-39: Reinforcement Activities – Use these open-ended activities to motivate students as they complete their speech session activities. Pg. 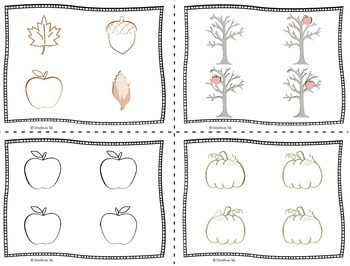 40: List of Fall/Autumn-themed books appropriate for preschool/early elementary ages. Thank you for purchasing this product. I hope you and your students have fun with it and find many ways to learn from it. Be sure to leave feedback and earn your TpT credits!